The strategic narrative of Australia’s new Defence White Paper  contains some interesting new aspects. One is the expression of much greater concern about the emerging maritime order in East Asia and China’s growing willingness to alter the status quo. In fact, the document reflects the end of the illusion in Canberra that somehow China will continue to accept the (predominantly) Western rules-based maritime order. The previous two Defence White Papers had quite different things to say about China. The Rudd government’s 2009 version  used fairly strong language on China’s evolving security challenge for the regional order. The Chinese reportedly weren’t amused. Four years later , the Gillard government markedly toned down the rhetoric, noting that China’s military modernisation was to be expected of a growing major power. 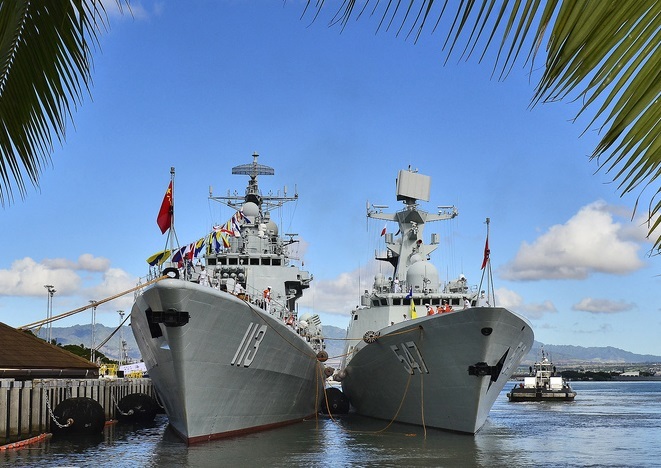 It’s reasonable to assume that just like the US-administration of Barack Obama, the Australian government at the time still had hopes that China would emerge as a ‘responsible stakeholder’ in maritime Asia. However, since then China has made abundantly clear that it doesn’t accept the established rules in maritime East Asia. Evidence for a growing assertiveness includes Beijing’s unilateral declaration of an East China Sea Air Defense Identification Zone in November 2013 which drew a strong response from the Abbott government; the creation and militarisation of artificial structures and disputed islands in the South China Sea (SCS); and attempts to coerce its smaller Southeast Asian neighbours into accepting its massive claims within its so-called ‘nine-dash line’. Australia’s response has been to demand the freedom of navigation in the air and sea in and around the disputed territories, to call for stop of all land reclamation activities, and to support US Freedom of Navigation Operations (FONOPs). It has also continued its own patrols in the SCS and has supported the Philippine arbitration case against China. As a consequence, the new Defence White Paper reflects the reality in maritime East Asia that China has moved to re-write the rules to fit its strategic preferences and historical narratives. As Peter Jennings points out , the document overall is ‘measured and restrained’ when addressing China directly, stressing repeatedly that Beijing still has an opportunity to play a constructive role in regional peace and stability. However, not only does the White Paper criticise China directly in some places; it also contains some strong messages on China without using the ‘C’ word, making it unmistakably clear that Canberra’s assessment about Beijing’s strategic trajectory has become more pessimistic. No genius is required to figure out that China is one of those ‘newly powerful countries’. While Russia’s actions have destabilised Europe, China has started to undermine the regional rules-based order in maritime Asia—and the white paper points this out unequivocally. It states that Australia ‘opposes the use of artificial structures in the South China Sea for military purposes’. While theoretically that includes other claimants such as Vietnam or the Philippines, the document goes on to specify that Australia is ‘particularly concerned by the unprecedented pace and scale of China’s land reclamation activities’. The 2016 Defence White Paper is thus much more specific about the nature of China’s security challenge to regional and Australia’s security than any of its predecessors, without labelling China explicitly as a threat. Yet, that was never the purpose of the document and reading between the lines is more than sufficient. Benjamin Schreer is Professor in Security Studies and Head of the Department for Security Studies and Criminology at Macquarie University. Edited image courtesy of Flickr user U.S. Pacific Command.